Find out more about the engine that powers the new Auris Hybrid, as we take a closer look at Toyota Manufacturing UK’s (TMUK) Deeside plant, the first Toyota factory outside of Japan to have the honour of building a hybrid vehicle engine. Anyone who’s driven Prius will know that the electric motor and petrol engine work seamlessly with each other. As we found out in Barcelona, it’s exactly the same for Auris Hybrid. When you need it, a powerful 1.8-litre VVT-i engine is on tap, while the electric motor helps conserve fuel and cut emissions at every available opportunity. The petrol side of this innovative Hybrid Synergy Drive system is manufactured at Toyota’s Deeside facility in North Wales. This doesn’t mean that the plant simply assembles parts sent from suppliers around the world – all casting, machining, assembly and testing for the engine is carried out at Deeside by Toyota’s experienced staff. Deeside has a proven history of successful engine manufacturing. As well as building the new Auris Hybrid powerplant, the Deeside factory also supplies Toyota’s 1.6-litre Valvematic petrol engine. 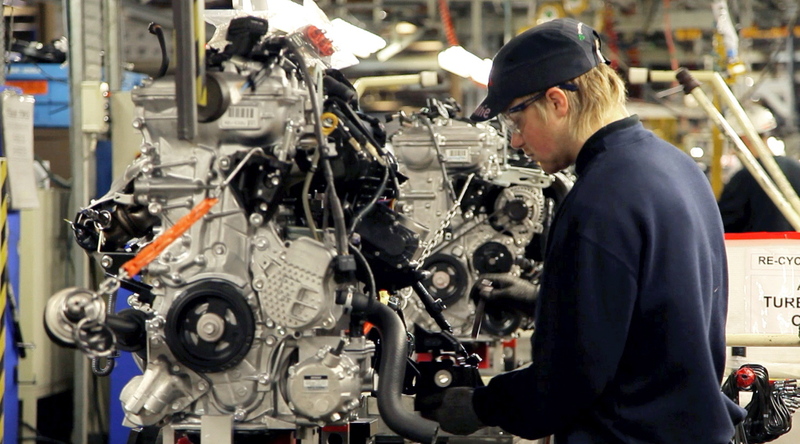 In 2009, the manufacturing facility produced over 130,000 engines to Toyota’s highest quality standards. As we revealed earlier this week, training for employees in preparation for Auris Hybrid production included visits to Toyota’s global factories, such as Shimoyama in Japan, the ‘mother plant’ for Toyota’s hybrid engines. This ensures that all of Toyota’s knowledge and expertise about hybrid engine manufacturing is integrated into every Auris Hybrid. Auris Hybrid is on sale from 1 July. To take a look inside Toyota’s Deeside facility, click on the video below. More images from the production of the new Auris Hybrid can be found here. I am an MBA student at the Manchester Business School . For my final year project I am reviewing the organisation hierarchy of manufacturing businesses. With a particular interest in organisations designed along Value Streams, something that my research tells me you are. Would it be possible for me to visit the site the see how this works in practice and possibly meet one of your Value Stream Managers ? You may want to get in contact with Toyota Manufacturing UK, (http://www.toyotauk.com) who maybe best placed to help with your research. If you need any more help do let us know and we can try and put you in contact with the right people.